Sometimes we mamas are literally on our feet all day long…from those pre-dawn baby feedings to late at night after the kids are bathed and tucked into bed. All that running to and from playdates, Target, and dinner prep can really put a strain on our tired little feet. 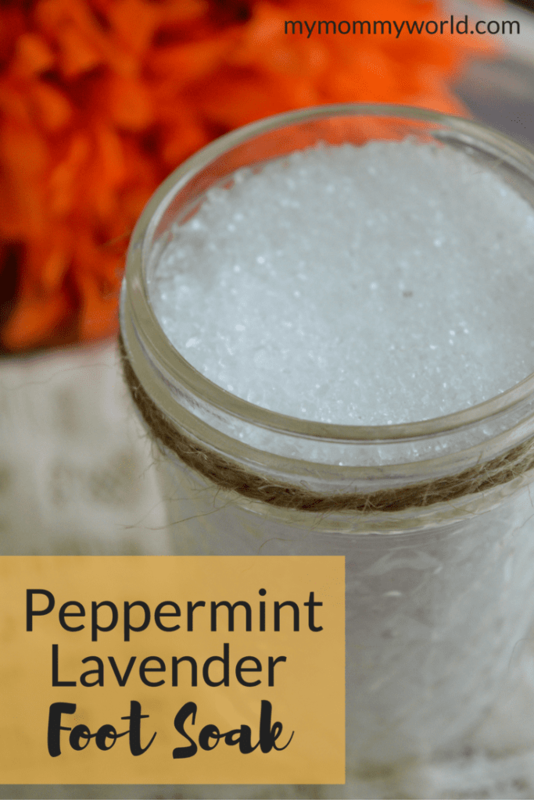 But this peppermint lavender foot soak can help you relax your feet and get ready for the next busy day. I like to keep a batch of this foot soak in my linen closet to pull out whenever I’m feeling like a little pampering is in order. It’s not hard to make, and costs much less than a trip to the spa. It also makes great gifts for the ladies in your life…friends, teachers, and even your own mom! Please note, this post contains affiliate links. 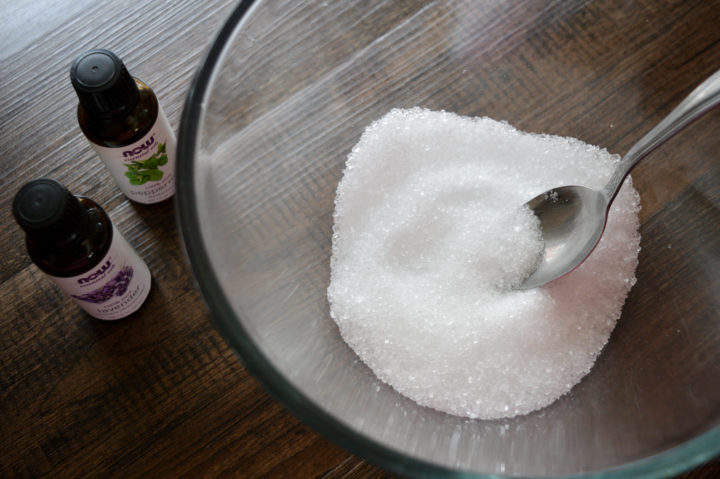 To begin, gather up your ingredients: epsom salt, iodized salt, and lavender and peppermint essential oils. You can buy epsom salt at almost any store. Drugstores and grocery stores usually carry it, as well as Target or Walmart. It’s not as easy to find the essential oils, however, so I usually order mine from Amazon. This peppermint oil from NOW is therapeutic grade and has good reviews, as does NOW’s lavender oil. These oils are also much less expensive than some of the ones available from the companies who sell through consultants. 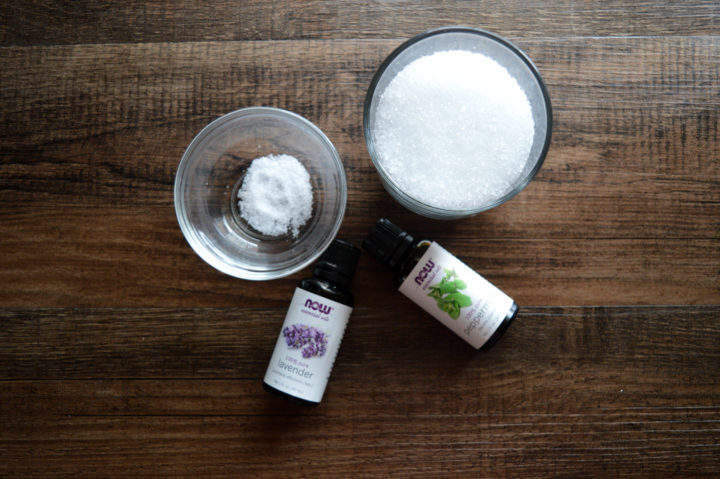 To make the foot soak, simply mix 1 cup of epsom salt with 1 teaspoon of iodized salt and several drops of each essential oil. I like 7 drops of peppermint and 5 drops of lavender. Mix well and store in a glass jar with an airtight lid. When you’re ready to use your foot soak, simply mix about 1 heaping tablespoon of the salt mix in several cups of warm water. Soak your feet in the water/salt mixture for 15 minutes, then discard. Using a scented salt mixture like this one is not just for the pleasure of using a nice-smelling product. 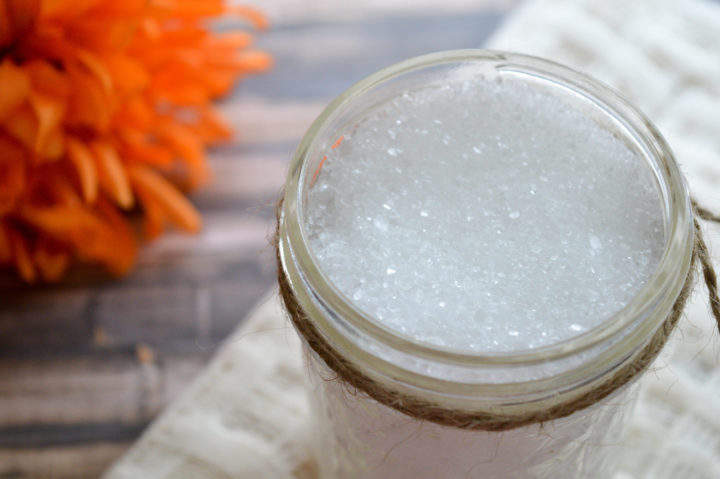 Each ingredient in this soak will benefit your tired feet. Epsom salts have been used for years to sooth aching muscles. Lavender oil not only has antiseptic and anti-inflammatory properties, but it is also known to help alleviate anxiety. Finally, peppermint oil is beneficial for the cooling sensation it brings to the body, but is also used to sooth muscle pain. Soaking hot, tired feet in this salt mixture will help soothe your feet muscles, cool them and help reduce any swelling. Plus, it smells great too! In a medium glass bowl, mix together Epsom salt and iodized salt. Add lavender and peppermint oil, mix together. If desired, add in additional drops of preferred essential oil. Store in a glass container with a leak proof lid, in a cool place. To make a foot soak, add in one tablespoon of mix to 8 cups of water. What a great recipe to try. I’m sure it smells wonderful too. Trying this now! After a couple days at Disney I need some foot help! Thank you!